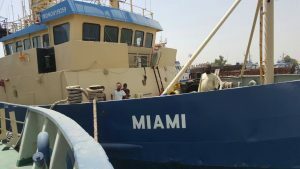 Justice Upheld was recently contacted by 6 Seafarers, Ethiopian nationals on board the ‘AHTMS Miami’ owned by Baltic Marine Services LLC’ whose registered offices are in Dubai. We understand that the seafarers were abandoned by the shipping company at Khorramshahr Port in Iran. The men have been without fresh food and fresh water for several week and are desperate to return to their families in Ethiopia. Daniel, one of the seafarers informs us that they have not been paid their respective salaries for several months. They are anxious and worried as to whether they will see their families. Likewise, their families are concerned for their safety, welfare and repatriation to their home countries. A contact at ‘Baltic Marine Services LLC’ said that the company is experiencing financial difficulties and that is the reason for the non payment of the salaries of the seafarers. We note from our experience that there have been a number of seafarers from around the world who have been abandoned on Krish Island and other ports in Iran. There appears to be a pattern; seafarers abandoned; their salaries have not been paid for months (or years in some cases); they are in a constant battle with the shipping companies rightly seeking payment of their overdue salaries; the seafarers cannot be signed off until their salaries are paid and their personal documents such as passports which are confiscated from them upon commencement of their employment by the shipping companies and are used as bargaining chips for their release. The shipping then expolite the captivity of the seafarers by pressuring them to accept lesser payment of salaries actually due to them. In addition, the shipping companies make it clear that they will deduct their flight fares from their income. During the course of their abandonment, the shipping company fail to take responsibility to provide the seafarers with fresh food and fresh drinking water. They whole process is by design used to wear the seafarers down so that they leave with a token salary – and not the amount originally negotiated at the outset of the commencement of employment. This is all part and parcel of modern slavery and the supply chain. Action must be taken against the offending shipping companies by the international communities and those who trade with them. We have alerted the relevant authorities in this case.